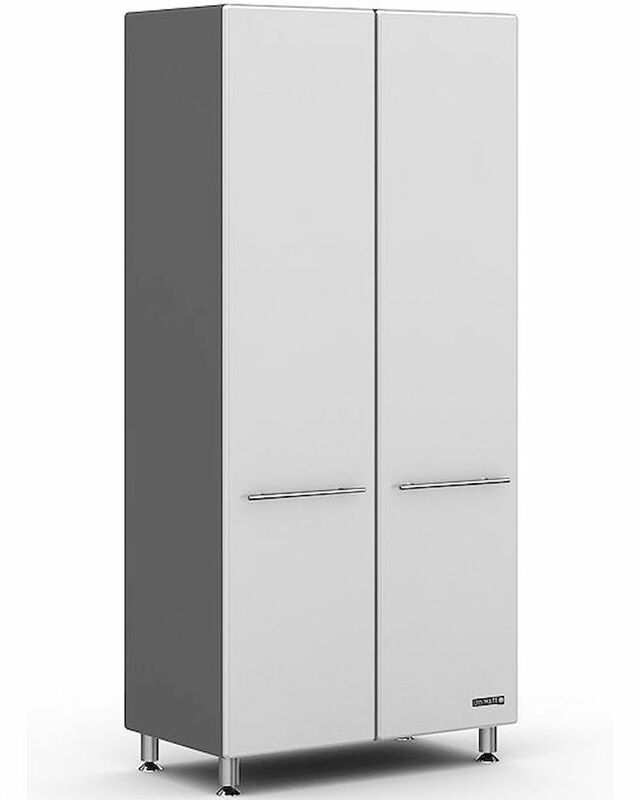 This beautifully appointed tall 2-door storage cabinet provides "Endless Possibilites" for use in virtually any room of the home or business with unique Starfire Pearl color and custom shop radius cabinet profile. Cabinet offers strong 3/4" cabinet construction with 300 lb load rating, oversized storage capacity, 2-adjustable and 1-fixed 3/4" shelf with 100 lb load rating, fully adjutable Euro hardware, beautifully appointed Brushed Chrome cabinet handles, designer style adjustable feet for uneven surfaces, 1" thick recesssed MDF worktop surface, easy assembly and much more. Great for use in; Garage, Laundry, Basement, Utility, Home Office, etc. Color: Starfire Pearl color on cabinet fronts and Grey elsewhere. 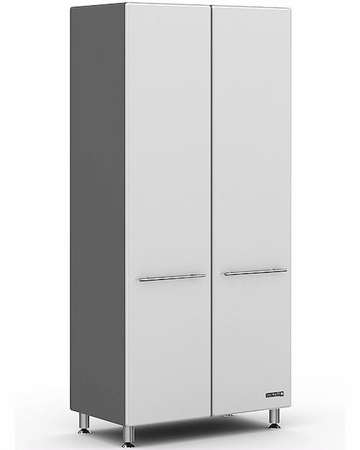 1 x Ulti-MATE Garage 2-Door Tall Cabinet GA-06SW. Unique Polyurethane Coated Cabinet Fronts for Added Style and Durability. Strong 3/4" MDF and PB Cabinet Construction with Textured PVC Laminate. Full Radius Profile and Cabinet Backing for “Custom Shop” Design. Fully Adjustable Recessed European Hinges and Ball Bearing Glides. Ergonomically Designed Oversized Brushed Chrome Handles. 4" Adjustable Feet for Uneven Surfaces and Inverted Wall. Cleat for Strong Wall Mount Installation. Integrated Recessed Worktop Surface on All Base Cabinets. SlipFit Steel Cam Post Assembly Hardware for Added Strength. The Ultimate Garage Storage features modular units that are fully expandable. This state of the art garage storage system transforms your space into a functional work area and provides plenty of storage options for tools, sporting goods, and household accessories. Ultimate Garage is built using polyurethane coated multi-density fiberboard (MDF) doors, drawers and facings for maximum strength and stability. Cabinets are assembled using a thermofused melamine laminate over MDF for a clean, finished and refined look.